PT. FARIKA DUTA AGUNG established since 1983 at Jakarta. 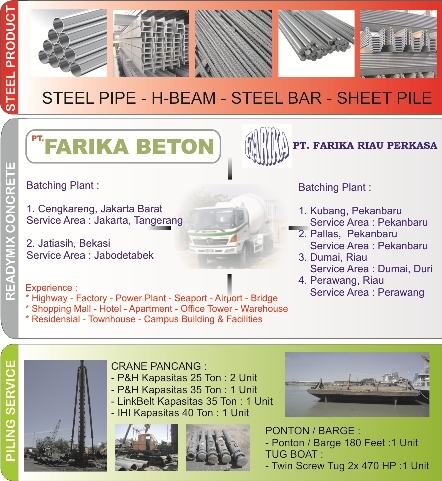 We supply steel product like Steel Pipe (Pipa Baja), Steel Bar (Besi Beton), Steel Sheet Pile (Sheet Pile Baja), and many other steel product since 1983 and had been supply for Aceh till Papua (Irian Jaya). At 1989 PT. Farika Duta Agung with PT. Hutama Karya Build Cawang - Tanjung Priok Inner City Highway which our role in this project as Concrete Readymix Production. From 1989 till 2009 PT. FARIKA DUTA AGUNG already established 6 location for Concrete Readymix Production. At 2009 PT. FARIKA DUTA AGUNG provide rental crane for piling and piling services. We also rent concrete pump and truck mixer.